My wife and I arrive at Georgia’s Greek Restaurant and Deli (323 NW 85th St. Seattle) around seven on a Friday evening. Fortunately we have a reservation, as the small dining room fills up quickly and empty tables are rare. Leena brings our usual drinks – “I hope this is what you want.” Yes, we are creatures of habit. After a cursory look at the menu we order our usual – octopodi (octopus), sautéed with garlic, olive oil, oregano, and splashed with Retsina for myself, and chicken souvlaki for my wife. As we await our food, Hank Bradley and Cathie Whitesides are tuning their instruments and adjusting the small sound system. Then the music begins. 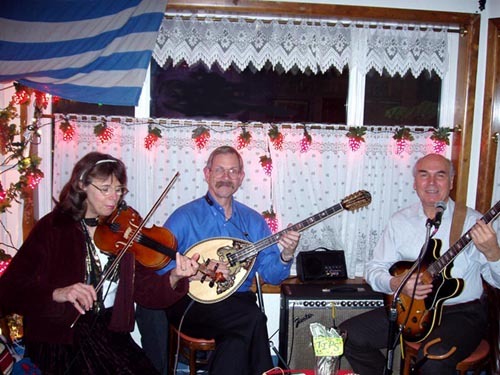 Cathie plays backup guitar while Hank begins a Greek tune on his bouzouki. His left hand runs up and down the long neck, while his right hand deftly picks out the right pair of strings with an occasional tremolo. The bouzouki, Hank explains, is a cross between a mandolin and a giraffe. This Greek instrument evolved from the Turkish saz. It came to modern Greece through Greek refugees from Asia Minor (modern western Turkey) in the early 1920s and was associated with the drug trade and low-life musicians. The music they played is known as Greek-Oriental Rebetica, a type of urban folk music which became the predominant force in Greek popular music of that time. Because of its association with hashish dens and criminal types, the bouzouki was once banned in Greece. The high-pitched baghlamá, a tiny version of the bouzouki, became popular since it could be concealed from police harassment. Hank and Cathie play mostly Greek Rebetica music. Hank grew up in the Santa Cruz area of California, and was captivated by the sounds of Greek music that he heard. This music became popular in the 1960s through the films Zorba, the Greek, and Never on Sunday. Hank is a self-taught musician who also plays fiddle, guitar, mandolin, and most other stringed instruments. He has a wide range of musical interests, including also old-time Appalachian and Eastern European. He will often sneak an old-timey tune in a Greek modal scale and rhythm into his playing at Georgia’s (yes, he’s pretty sneaky, but with a good sense of humor). He learned the ‘old-time’ Greek music from tapes of two collectors, Dino Pappas and Martin Schwartz. As we enjoy the good food and music, we are startled by a flash of flame in front of the deli counter. Lakis has just ignited a skillet of saganaki (broiled Greek cheese) with brandy – OPA! As the flames almost reach the ceiling, he extinguishes them with a squeeze of lemon juice. Georgia Kazakos and her extended family have been involved in the restaurant business for 35 years. The restaurant first opened in 1991. Today, Georgia's son and present owner Lakis Kazakos continues the family legacy. Georgia arrives later in the evening, greets us and other guests, and urges us to get up and dance or at least sing along with the music. After playing for about thirty minutes, Hank and Cathie switch instruments. Hank takes the guitar while Cathie picks up her violin. Cathie plays Greek tunes and also Eastern European music. She came to Berkeley in the late 1960s, from Salt Lake City where she grew up in a musical family. She was attracted to the folk music scene and began playing fiddle. She was particularly enchanted by some Eastern European music that she heard. She first met Hank there when she heard him play fiddle. Some years later she moved to Seattle and they were married in 1993. Cathie is also a talented and sought-after contra-dance musician and teaches fiddle when she isn’t busy performing. As I listen to Cathie’s fiddle playing, she sneaks a few bars of an Irish fiddle tune into her Greek or Eastern European music since she knows I like Irish music. And now a few people are dancing in the small space between the deli counter and the dining tables, while the waitresses carefully maneuver around the dancers. I estimate that there is room for fifty or sixty people if all the tables are full – barely enough room for the waitresses to move between tables. It is particularly crowded tonight with Greek families, contra-dance people, and others like my wife and myself who just like live music and good food. A couple of small children sneak up to the musicians to see them play and put a few dollar bills their parents have given them into the tip jar. 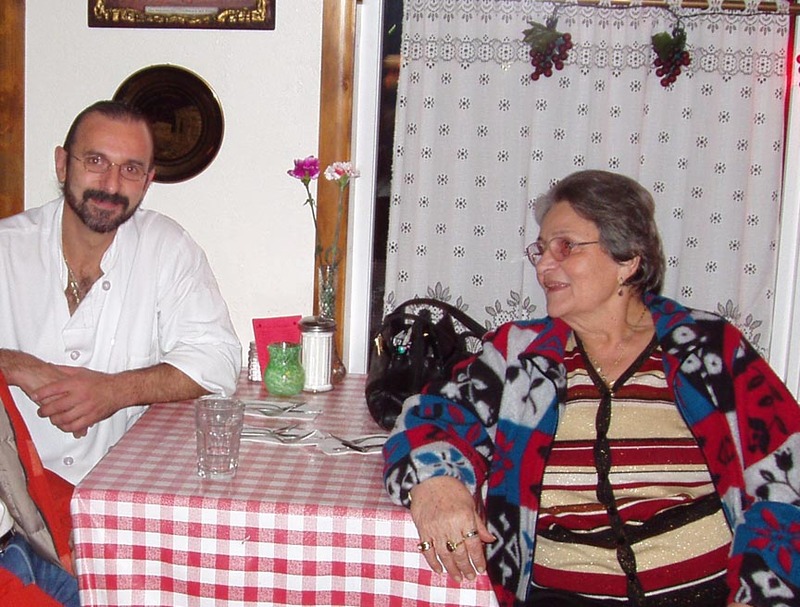 This is a typical Greek family restaurant, full of music, dance, and families of all ages. Lakis would have it no other way. A few years ago the music was temporarily shut down. Due to some strange Seattle liquor license regulations – children in a restaurant that served wine and beer, or children at a music venue were okay, but when you mixed them together it suddenly became bad – the liquor board threatened to shut down the restaurant. Lakis took his protest to Olympia, and was aided by city councilman Nick Lacata and an article in the Seattle Weekley. The liquor board backed down as long as there were no complaints or drunken brawls reported (not likely at Georgia’s!). In the 1960s Yiannis left Greece with his wife and infant child to tour America with a band. He stayed in America working as a full-time musician, and came to Seattle about twenty-one years ago. He flourished as a professional musician, playing at Greek weddings and clubs around Seattle. As the first-generation Greeks got older and went to clubs less often, it no longer provided a full-time living. He reluctantly turned back to metalworking, a trade he had learned in his youth. About fifteen years ago he met Hank and they struck up a close friendship. He greatly influenced Hank, who learned much modern Greek music from him. Yiannis sings both Rebetica and more popular Greek songs in both English and Greek. We greet Yiannis and regretfully tell him that we have to leave early tonight. But we heard him sing last Saturday when Cathie was out of town for a contra dance and he and Hank played. He has a wonderful voice and we thoroughly enjoyed listening to him. We promise that next time we will come later and hear him sing, and experience the dancing that gets into full swing late in the evening. As we drive to our home a couple of miles north of Georgia’s, our stomachs are comfortably full of Lakis’ good food, and Greek tunes are dancing around in our heads. A great way to unwind on a Friday evening! Check Georgia’s web page for the live music schedule and a sample menu. The Folkvoice Trio (music from Scandinavia to Sicily and many points between), Balkanarama (Macedonian, Greek, and Balkan music), and Ensemble Sub Masa (Romanian and Balkan cafe favorites) also play at Georgia’s. Stewart Hendrickson is Chemistry Professor Emeritus – St. Olaf College, Research Professor Emeritus University of Washington, and in his new career, an unemployed folk musician (voice, fiddle, guitar; stewarthendrickson.com). Reprinted from The Victory Review, January, 2004.